Before we start with the comparison, let us define what a heat pump is. It’s a device or an equipment that transfers heat from a low-temperature fluid to another that has higher temperature. It got its name from that ability – carrying heat to higher temperature level from a lower temperature, which inverts the natural process of heat flow since it usually starts from a higher temperature and goes to a lower temperature. This process can be related to a water pump that is positioned between 2 connected water basins placed at different elevation. Naturally, water will flow to the lower part. However, with the help of a pump, the water can be returned to the higher basin. For every heat pump, there is a closed circuit which is where the refrigerant flows. This refrigerant, according to pressure and temperature conditions, can take on a gaseous or liquid state. What this circuit comprises differs from gas to electric heat pump. Both the evaporator and the condenser include heat exchangers. These heat exchangers are special tubes where the refrigerant will flow. The heat will be transferred from the evaporator which has the lower temperature to the condenser which has the higher temperature. Condensation: from the compressor, the refrigerant will turn to liquid from gas which will give off heat to the outside. Expansion: once the refrigerant passes through the expansion valve, it will cool and will be partially transformed into vapor. Evaporation: the refrigerant will evaporate completely as it absorbs heat. Compression: refrigerant that is currently in gaseous state and has low temperature will be taken a higher temperature; it’ll undergo compression which allows it to absorb heat. These are the transformations that happen in an electric heat pump. The compressor will provide energy to the refrigerant, the refrigerant will then absorb the heat in the evaporator from its surrounding medium, and will then be transferred to the medium (through the condenser) to be heated. Condensation: from the generator, the refrigerant will turn to liquid from gas, which will give off heat to its external fluid. Expansion: the refrigerant will be cooled as it passes through the restrictors. Evaporation: the heat from the external fluid will be absorbed by the refrigerant and will turn to gas. Absorber: an absorbing liquid will absorb the refrigerant which will turn it to liquid. Generator: with the help of a gas burner in the generator, the refrigerant will be heated, evaporating it and increasing the pressure and the temperature. These are the transformations that happen in a gas heat pump. The gas burner will supply energy to the refrigerant and as it passes through the evaporator, it’ll absorb heat from its external fluid, and it will then be transferred to the medium (through the condenser) to be heated. It will consume electrical energy for its compressor. It will give off heat to its medium so it can be heated in the condenser (water or air). It will consume LPG/natural gas in its generator. For an electric heat pump, the efficiency is measured by its coefficient of performance or COP which is the energy it supplies divided by its consumption of electrical energy. Generally, it has an approximate value of 2.5, but the COP varied according to its type and operating conditions. This means that it will supply approximately 2.5 kWh of heat energy to the medium, for each kWh of electrical energy that is being consumed. The higher the temperature (source) and the lower the temperature (in the condenser), the greater the efficiency will be. Remember that the heat output is dependent on the temperature at which the pump absorbs heat itself. 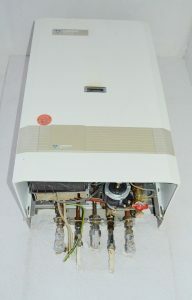 The heat pump will be deactivated and the performance will be significantly reduced if the temperature of the cold source is within -2 degrees C and 2 degrees C.
For a gas heat pump, the efficiency is measured by its Gas Utilization Efficiency or GUE which is the energy it supplies divided by the energy the burner consumes. The rate varies according to type and operating conditions and its general value is approximately 1.5. This means that it will supply 1.5 kWh of heat energy to the medium, for each kWh of electrical energy that is being consumed. A gas heat pump is able to operate even at a temperature of -20 degrees C, which provides an efficiency of around 1. This is comparable to a condensation boiler. These are the differences and similarities of a gas heat pump and an electric heat pump. Knowing each would be able to help you identify the best heat pump for you and your home.